FRENCH POLYNESIA IS a French overseas territory situated in the south central PACIFIC OCEAN. 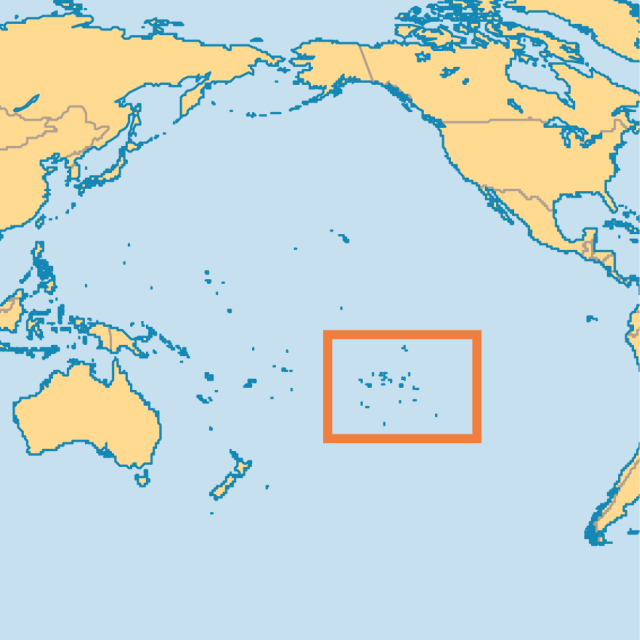 There are five inhabited archipelagos: the Society, Tuamotu, Gambier, Australes, and Marquesas island chains. The islands are volcanic but the Tuamotu chain is made up of low coral atolls of which there are 80. French Polynesia numbers 121 islands in all, 76 of which are inhabited. The volcanic islands are mountainous and the interior is generally inaccessible. Only the coastline and low hills are inhabited. These high islands are ringed by coral reefs that enclose shallow lagoons. Tahiti is the largest island and covers 402 square mi (1,041 square km). The capital, Papeete, is on Tahiti and approximately two-thirds of the population live on that island. Temperatures range from 77 to 86 degrees F (25 to 30 degrees C), and the climate is tropical and humid with a relatively dry season that runs from April to October and a rainy period from then on, when temperatures generally rise. The French Polynesian archipelagos were sighted by European explorers in the late 1500s and early 1600s. But Tahiti was officially “discovered” by the British in 1767 and baptized King George’s Island. The Marquesas Islands were annexed by the French in 1791 and the rest of Polynesia became a French protectorate in 1842. In 1880, Tahiti became a colony. The other South Pacific archipelagos were gradually annexed, and together the islands came to be known as the Etablissements français de l’Océanie. In 1946, the islands became a territory and acquired relative autonomy. In 1957, the Etablissements were renamed French Polynesia. French Polynesia has its own government with a president and a territorial assembly that has 49 elected members. The Tahitians elect two deputies to the French National Assembly and one senator to the French Senate in Paris. The president of the French Republic appoints a high commissioner (haut commissaire) who is responsible for public order and safety and ensures that civil liberties are properly respected, but he or she does not exercise executive power, which is in the hands of the territorial government. Autonomy was extended by statute in 1977, 1984, and 2004. FRANCE retains jurisdiction in matters such as foreign affairs, currency, defense, public order, civil liberties, and higher education. The Polynesian government has authority in all other areas. The official languages are French and Tahitian (reo maohi). Nuclear testing was carried out in Polynesia on the atolls of Mururoa and Fangataufa in the Tuamotu chain from 1966 to 1996. The economic windfall was instrumental in the territory’s development. In 1996, when testing and the related funding came to an end, the French government made important financial commitments in Polynesia to ensure future economic growth and sustainability. The economy is based on the provision of administrative and commercial services, but French Polynesia does have a relatively healthy fishing industry and produces black pearls. The islands are also popular tourist destinations for the French and other Europeans, making tourism an important part of the local economy. Nevertheless, government subsidies are essential to French Polynesia’s economic survival. The islands import far more (mainly from France) than they export (mainly to France), but JAPAN and AUSTRALIA are also important trading partners.